← The Agora of Smyrna. The Persecuted Church. 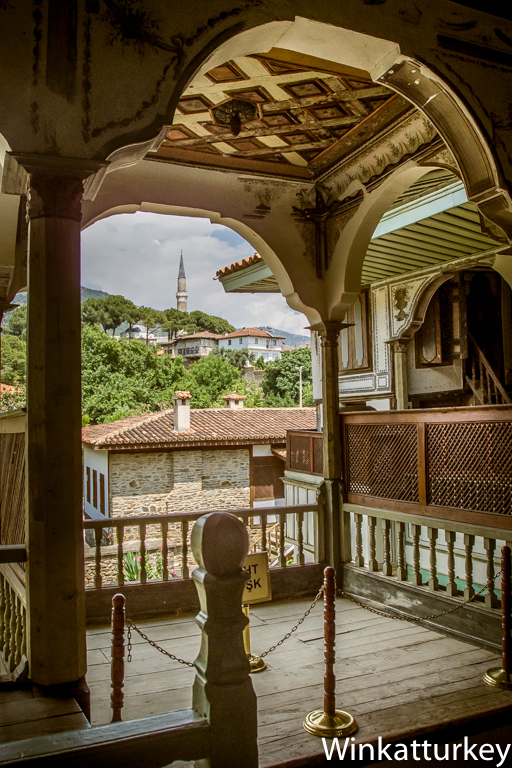 In the small village of Birgi, located in the mountains of Izmir, found this wooden house is one of the last representatives of the Ottoman mansions Aegean. Fully decorated with paintings and surrounded by gardens, the Çakırağa Konağı was built in the second half of the eighteenth century and offers a different excursion among the wide range of the third largest city. In 1761 Sheriff Aliaga, un Rico miembro of the family Çakirağa, commissioned the construction of this mansion in the mountains of Izmir. This is not the typical Ottoman house on two floors but a real mansion with three floors showing the economic situation of their wealthy owners. It was inhabited until 1950 and after a restoration that began in 1977 opened to the public in 1995. You can also visit an oriental house is right next. The mansion is located in the center of town, to the left of the river as we Odemis. The lower floor was the service, and included an area for receiving guests, service rooms and kitchens and stables. The first floor was to be used in winter and found five rooms with fireplaces and a bathroom. On the second floor life became summer and include two large rooms. The floors are connected by wooden stairs with balustrades of the same material that extend the viewpoints. The cover is also made of wood and the doors and windows have also been restored. In all rooms and public areas enjoy a rich decoration with paintings covering even the ceilings. Find floral representations, fruit and calligraphic motifs. In many rooms there are paintings depicting curtains around the windows and even false columns. On the roofs there are also paintings of the moon and stars. Serif Aliaga wives of Tennis, one of Istanbul Izmir and other. To help overcome nostalgia for its beautiful hometowns, the homeowner shoots one decorate the halls with a huge mural capital of the Aegean and the other room with a representation of Istanbul. This affectionate deference to his two wives allows us today to see how the two cities were more than two centuries ago. To go to Birgi have to leave the Izmir-Aydin highway exit and heading to Torbali Odemis. About 8 Km after passing the latter town reach Birgi. If we can go from Izmir also choose to leave for Ankara and then head to the ski Bozdag to cross the mountains to the south and go right Birgi. This route offers beautiful views but we must be careful in winter in times when there is snow because the roads may require the use of chains.